Finding a new place of worship can be a challenge, and we want to make it as easy as possible. You’re sure to have questions, so we’ve compiled some of the questions we’re most frequently asked by those new to our area. We welcome you to our worship community! How do I arrange visits or Anointing for my ill or home-bound family member? I’m not Catholic, but I have a calling to the church. How can I become Catholic? How can I become more involved in the church? I'm new. How do I get to know people? How do we arrange for our child to be baptized? Do you have a cry room, or are children welcome within in the church? What if a loved one or I have difficulty being in the church space but want to attend Mass somehow? We know that each family is different and has unique needs. For this reason, we celebrate Mass multiple times a day, seven days a week. Visit our Home page for Mass times. We are sorry for what you are going through. Please view this document to find the answers you need. God calls to us in both ordinary life and in times of life changes. If you have a calling to God and our church, welcome! Our Becoming Catholic page will help you take the steps to begin fulfilling God's calling for you. From adult enrichment and religious education, to Liturgy and music, to community enrichment and social action, to commissions and the Catholic Multicultural Center, we welcome you to serve God, fellow members of your QP faith community, and those in need in the Madison area. We love to help couples get started on their lives together. We require couples to make arrangements with a priest at least six months in advance. Call the Parish office at (608) 231.4600. You can also find more information on our Sacraments page. Welcome! Our Lady Queen of Peace invites all new members to a semi-annual Welcome Lunch where you can meet other new members, find out about ways to get started, and meet staff and volunteers. You'll receive an invitation to this lunch, a new member packet, and a welcome call from a member volunteer. If you have questions, don't hesitate to call us at 231.4600. We are happy to help you become the first teachers of your children in the ways of your faith and to welcome your child to the Catholic community. Please check out the process on our Sacraments page. Both! Children are the future of the church! Children of all ages are most welcome at all Masses at Our Lady Queen of Peace Parish. New parishioners and new parents, did you know there is a special family room for families with children who are naturally vocal or active during Mass? It is located at the highest point in the back of church for good visibility and sound. If you prefer to sit with your young children in the main seating area, you are more than welcome to do so. As a courtesy to others around you who may be hard of hearing, please consider moving to the family room if your child becomes vocal during the Mass. 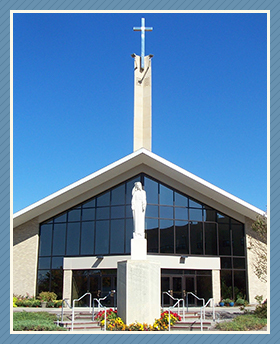 At Our Lady Queen of Peace, Masses are projected to the screens in the Gathering Space, where there is easy access to restrooms, plenty of space, and access to take Communion. Learn more about our Mass projection option.